The Snail ring is a new contemporary design. This is a original version of the “Snail Ring". 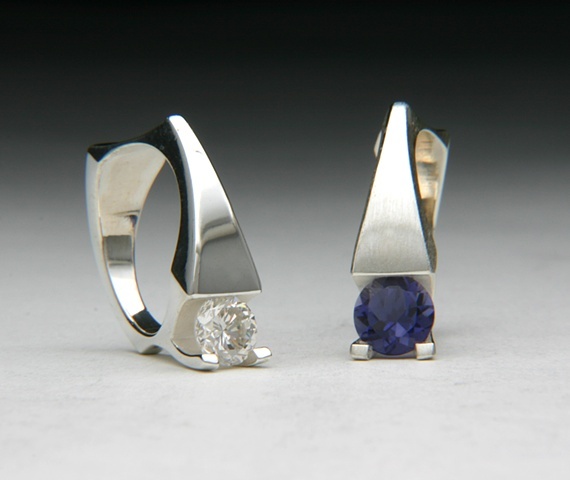 We had a customer one two rings so she could wear them together with the stones face the opposite directions. The stone are a Diamond and an Iolite. The stone are set on the side of the ring giving it the appearance of sitting between the two fingers. It has side comfort fit curves, so the ring is comfortable between each finger. The metal is 925 Silver with a "De-ox" alloy to prevent tarnishing like regular Sterling, but it can be made in any metal.